Was the Old Kingdom founded after the last catastrophe in 1159 BC? Domain Of Man > General Category > Egyptian Old Kingdom > Was the Old Kingdom founded after the last catastrophe in 1159 BC? 1159 BC is the Date ... but probably not for Thera! I did some more thinking about this over the summer. Even in the traditional chronology Sargon (2334 - 2279 BC) and Pepi (2333 - 2283 BC) are exact contemporaries. It has been argued, most notably by Michael Astour, that Sargon should slide forward a little, however there are compelling reasons to leave the association alone (see below). The debate involves the date of a palace destruction in Ebla, which contained the lid of a vase inscribed with the cartouche of Pepi in the ash layer. It's interesting that the modern name of the site of the palace is Tell Mardikh (Marduk). Anyway, the standard chronology justifies such an early date for Sargon (contemporary with Pepi or slightly after) by inflating the following dynasties. A successor of Sargon, Naram-Sin, was defeated twice by the Gutians. However, his vanquisher Gudea (another son/grandson of Sargon) is placed at least 50 years later. Gudea is considered by Academics to be a barbarian, yet his reign represented a brief return to Sumerian high culture and produced many of the masterpieces of the Era! It's time to recognize that Gudea represented a continuation of the Dynasty of Sargon, especially at Lagash where Sargon was better known as E-anna-tum (or Tem/Atum/Adam II for short!). Gudea may have ruled the eastern hordes, but he was clearly a child of the purple. Sargon and Gudea also also found at Uruk, where they appear as Ur-Nigin and Kuda, respectively. The name "Ni-gin" transposes/transliterates to "Sar-gon" quite readily. (Ni/En = Sar) Kuda and Gudea or also easily recognized as variants. Ruling between Ni-gin and Kuda at Uruk is one Ur-Gigir. Gigi (Agog/Agag) is a name that has previously been associated with that of Pepi/Apop. Ur-Gigir obviously associated with Pepi II. Gudea was the son-in-law of one Ur-Baba, which probably corresponds to Ur-Bau (Manishtushu) "eldest son" of Sargon the Great. One must wonder if Sargon's demise was disguised under the Gutian name of Tirigan, and whether there is any difference between his vanquisher Utu-khegal ("last king of Agade") and Ur-Utu (of Uruk) or Naram-Sin (Sin=Utu=Thoth). Gudea's subsequent defeat of Naram-Sin was simply part of a succession battle among the princes of Sargon of Agade's court! However, the biggest distortion in standard chronology after Sargon involves not recognizing that the 3rd Dynasty of Ur (that followed the Guti Dynasty) was contemporary with the 12th Dynasty of Egypt (and Larsa Dynasty in Mesopotamia). So, if 1159 BC is the start date for the Egyptian Old Kingdom, where does that put Thera/Santorini. Thera has recently been carbon dated to 1628 BC, however I think we all know that this only means 1628 BC is the date the eruption could not have occurred. All carbon dates from this time period are far too old. But how much should it be moved forward? Could it be moved forward all the way to 1159 BC? That seems a little too much, but not impossible. Thera very well could be a "pre-dynastic" city. Thanks to Gobekli Tepe we know that many amazing cities existed in the Near East thousands of years before the pharaohs. That Thera/Santorini could have existed a few hundred years prior to the Old Kingdom should no longer be surprising. Nor should it be surprising that an Egyptian artifact was found at Santorini, because we now know that the Pyramids and other structures in Egypt predated the pharaohs! 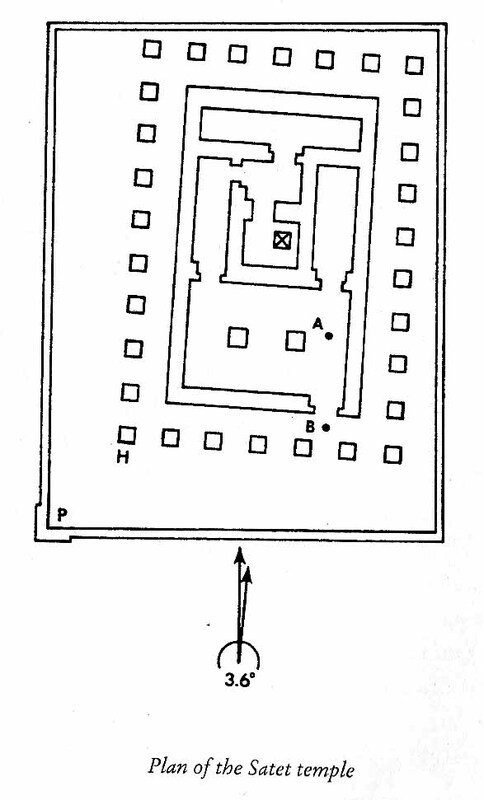 Bauval gives two different values for the change in orientation of the Satet Temple built by Hatshepsut and Ptolemy II. Another diagram from page 118 of the book shows a 3.6 degree difference. The outer wall is that of the Ptolemaic temple and the inner structures are that of the Hatshepsut temple. Bauval also quotes Ron Wells as saying the difference is 5.95 degrees between the two temples (with one built over the other). This is over a period of 1200 years (within the academic/standard chronology). However, the first diagram indicates that there was a rotation of about 45 degrees between Dynasty 1 and Dynasty 6, which is only an interval of about 600 years (again within the academic/standard chronology). 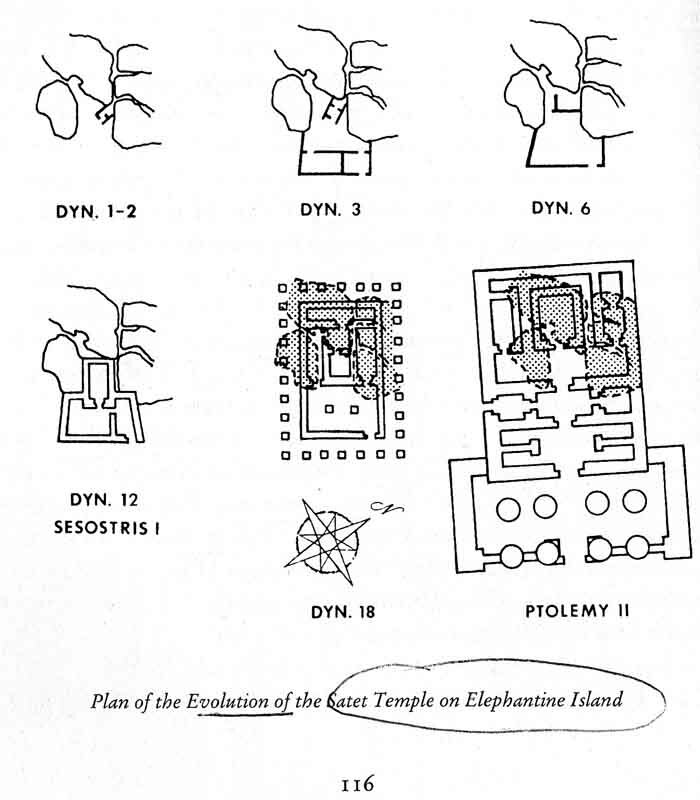 There is little or no change in orientation between the 6th Dynasty temple and those of the 11th and 12th Dynasties. The 12th Dynasty temple was the first stone temple at the site and replaced the 11th Dynasty mud-brick temple. The 18th Dynasty temple appears to be rotated backward slightly, if at all, with respect to the 12th Dynasty temple. What's more, Bauval claims that there was only a 2.5 degree change in temple orientation at the Temple of Isis at Dendera over an interval of 1200 years between Caesar Augustus and Ramses II (within the academic/standard chronology). Denderah is about 100 miles north of Aswan. Clearly, there is no consistency in these observations and there must be some other explanation for changes in temple orientation from one period to another. "... this small site [temple of Satet] is of particular importance. Due to restrictions in the topography of the site, the ancient builders sealed, under multiple floors, previous templs built on the same spot. First, beneath the 18th-dynasty floor was found the remains of a structure of the 12th dynasty and another of the 11th dynasty. An Old Kingdom temple dating to the 6th dynasty then emerged. Beneath all these ancient structures the level of an even earlier shrine of the Early Dynastic period was eventually reached." It isn't clear just how many "floors" or levels exist at the temple site. Of particular importance to us is the presence of 6th Dynasty structure immediately followed by an 11th Dynasty structure (or enlargement?). We are attempting to determine whether these two dynasties were contemporary. To wit, Montuhotep II was the 11th Dynasty king that modified the Satet temple. This does not preclude building there at a slightly earlier time by a 6th Dynasty king or queen. In fact, the 18th Dynasty activity provides us with some ability to interpret the 6th/11th Dynasty work at the site. Hatshepsut began construction of a new temple of Satet on the site, but it was taken over by Thutmose III. Recall also that Thutmose III had a similar typecasting as Montuhotep II, who was considered the "Levi" of his royal generation. Thutmose III was then likely following a precedent and Hatshepsut may have as well. In other words, we can deduce that Hatshepsut was following the lead of a 6th Dynasty queen (or perhaps a king that she was emulating in her status as pharaoh). Typecasting is very strong evidence for concluding that the 6th and 11th Dynasties of Egypt were contemporary. Prior to the 18th Dynasty there was also a double dynasty. Egyptologists recognize that the 15th and 17th Dynasties were contemporary. The 15th Dynasty list includes two kings named Apophis, which is a variant of 6th Dynasty Pepi I & II. The 17th Dynasty list includes kings named In(yo)tef, Sobekhotep, and Tao. The 11th Dynasty list includes kings named Montuhotep and Inyotef. Montu and Sobek were both aliases of the god Set. The 10th Dynasty king list includes kings named Akhtoy, which is mimicked by the name Tao. The ensuing 18th Dynasty includes king names that paralleled the 12th Dynasty. Instead of Amenemhet there is Amenhotep. Instead of Senusret there is Thutmose. Senusret is defined as "Man of the Strong (Goddess)". It is not certain which god this refers to, but based on the 18th Dynasty repetition it probably designated Thoth. So, we have a very close correspondence between names of the Early New Kingdom and those of the Early Middle Kingdom. It could be argued that the New Kingdom pharaohs were "telescoping" former dynasties of Egypt. That is a possibility, however the simpler explanation is that the 6th Dynasty was in fact contemporary with the 11th Dynasty and that these double dynasties were regional or ethnic in nature even as the later 15th (Hyksos) and 17th (Upper Egypt) dynasties. The "role model" of Hatshepsut in the 6th Dynasty was clearly queen/king Nitocris (Neith-iquert). Hatshepsut was married to the Judah-figure Thutmose II. The Judah-figure of the 6th Dynasty , Pepi II, had queens named Neith A and Ankhenespepy III, who may have been one and the same with Nitocris. Both the 6th Dynasty and the 18th Dynasty had a king named Teti as their nominal founding father. Teti of the 6th Dynasty was eclipsed by Pepi and his sons Pepi II and Nemtyemsaf. Teti of the 18th Dynasty was pushed aside in favor of Tao II/Apophis II and Thutmose sons of Tao/Apophis. The name Nemtyemsaf, "(the god) Nemty is my protector" parallels Thutmose. Nemty ("traveler/wanderer") may have originally been an epithet of Thoth. Ankhenespepy III was the daugther of Nemtyemsaf, as Hatshepsut was the daughter and intensely devoted successor of Thutmose I.
I don't know if there is any evidence that the 6th Dynasty construction at the Temple of Satet can be attributed to Neith A/Ankhenespepy III/Nitocris. However, it seems quite probable that this was the case, and that her work there was quickly replaced by that of a male ruler (namely Montuhotep II), even as Hatshepsut's construction at the Temple of Satet was claimed by the next pharaoh, Thutmose III (the equivalent of Montuhotep II in the 18th Dynasty). In conclusion, there was definitely an emulation by the 15th/17th/18th Dynasty pharoahs of the earlier 6th/11th/12th Dynasty pharaohs. Every indication is that the 6th Dynasty and 11th Dynasties were contemporary and followed immediately by the 12th Dynasty even as the 15th and 17th Dynasties were contemparary and followed directly by the 18th Dynasty. According to the accompanying article, the only 6th Dynasty articles found belonged to Pepi I & II and Nemtyemsaf (Merenre). However, articles belonging to Nitocris (Neith A/Ankhenespepy III) could have been removed ala many of the articles of Hatshepsut at Thebes. It is curious that the 6th Dynasty temple of Satet would not contain articles associated with a queen or the goddess herself. Thutmose III evidently did not remove all traces of Hatshepsut in the 18th Dynasty Temple of Satet. Re: Was the Old Kingdom founded after the last catastrophe in 1159 BC? I suspect that this location [the Satet temple] inspired the biblical story of Moses being directed by the Lord (again, a goddess in this case) to strike the rock so that life-giving water would gush forth. Elephantine Island is the mythical source of the Nile and it was apparently possible to hear the coming flood before actually seeing the level rise. An annual "Striking the Rock" ceremony would have made for a very nice religious experience. A really interesting observation of Bauval is that during the Amarna period 730 altars in the Great Temple of Aten at Amarna and 730 statues erected by Amenhotep III to the goddess Sekhmet in Luxor as a prescription against the plagues of that time, and that 730 is exactly half of the 1460 year cycle of Sirius. Bauval concludes that the Egyptians were counting these years and knew they were half-way through a cycle. In the Egyptian Flood story Sekhmet ravaged the people with plagues and had to be appeased. These plagues were variously caused by either too little flood water or too much. Consistent with this, biblical Moses is instructed to strike the rock only once. However, Moses becomes impatient and strikes the rock a second time, for which he was to die. No strikes apparently meant too little flooding whereas two strikes would result in too much water. It literally was a matter of life or death. The whole drama of an "Exodus" involved escaping the consequences of a Nile River that had in one extreme or the other suddenly become adverse to life. If Bauval is correct about 730 being a chronological marker, then that should help us determine the approximate time for the Amarna Period. Unfortunately if you go 730 years back from the 139 AD (the start of a Sirius cycle recorded in Roman times), you only get to 591 BC. You have to go a full cycle of 1460 years to arrive at the traditional time for Akhenaten. There wouldn't be any reason to use the symbolism of 730 in that time period. They should have then built 1460 altars and 1460 statues instead. However, 591 BC happens to be the right time for Akhenaten in a revised chronology that takes into account the many parallel dynasties (ala Atlantis) during Egyptian pharaonic history.